The crunch of snow under my crampons. The blasts of wind. Glancing up at the knot dangling from my harness to make sure I maintained proper rope interval. Humming 'The Drumming Song' by Florence and the Machine. One foot in front of the other. Rest step with attitude. Use your knees as hinges. Big pressure breath. Ice axe in the uphill hand planted in the slope for balance. Listen for rock fall. Ignore the sound my crampons make on rock. Repeat who I'm climbing for - "Candace, Kids, Supporters at Home, Myself." Chomp down on frozen Snickers bar and remember to put summit food in my pocket so it doesn't freeze.Watch the sun rise over Mount Adams and realize, again, how small I am. Look around at Tiffany, Sara, Hillary, Alicia, Amy, Solveig and Melissa and feel like I deserve to be here. I belong. I am strong enough, and I'm going to make it. Alicia, Hillary, Sara, Me, Kruti, Amy, Tiffany. Photo courtesy of Tiffany Royal. I can't believe it happened. But I know it did. I just took out the certificate of achievement my rope team leader and mountaineeress extraordinaire Solveig handed me while we chowed down on recovery pizza at RMI Basecamp in Ashford. She told me she knew I'd overcome a lot of anxieties on the trip, and she was right. Seven months of preparation, encouraging words from friends and family, $5,153 raised for Big City Mountaineers for four days of learning and climbing, and life changing experiences. 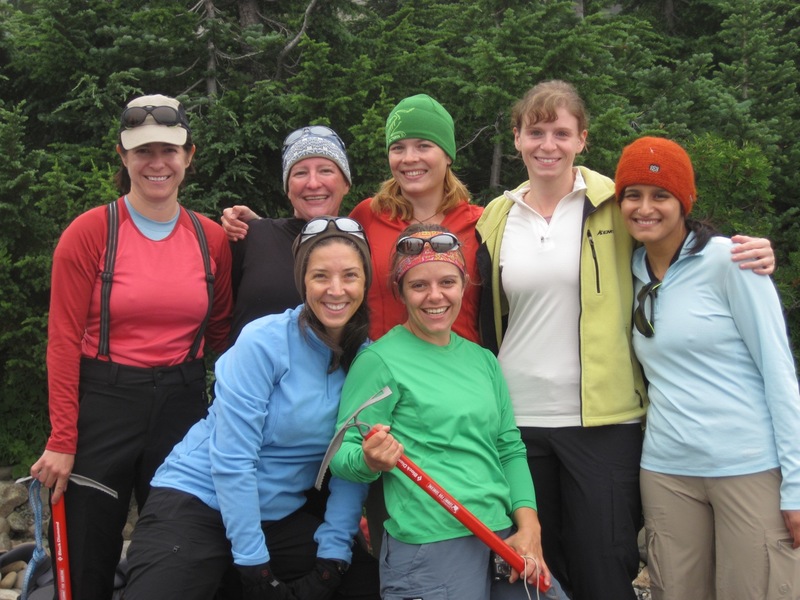 In total, the Mount Rainier Women's Climb participants raised over $38,000 for BCM. It's been just over a week, and I'm still learning from it all. The days after, I'd feel as though I needed to cry on several occasions, whether out of pure relief we accomplished our goal safely, out of sorrow because it was over, or another reason entirely. It was one of the most physically and mentally demanding things I've ever done. My whole body ached by the end. I spend a good portion of our upper mountain ascent feeling like I do when I lead climb - mildly in control and absolutely terrified. But every time I glanced forward to the lifeline tying me to Tiffany, or to the side at the expanse of snow, ice, and rock below us, I couldn't help but think, "I am the luckiest girl in the world." It was at our second break atop the Disappointment Cleaver at 12,300' in the dark on Saturday morning, August 21st, that I realized I was going to make it. I felt tired, but strong and capable. I had no appetite, and despite both that and being half asleep, I knew Mount Rainier was going to allow me to climb her that morning. Our journey as a team began three days prior when we all met in Ashford, WA at RMI Basecamp for our gear check. It was a chance for us to get to know each other and ask any last minute questions. I had a little celebrity shocker moment when I met our lead guide, venerable mountaineering powerhouse and First Ascent sponsored athlete Melissa Arnot. Assistant guides Solveig and Carrie, equally talented and impressive, would join us over the course of the next day or two. We couldn't have asked for a stronger, more cohesive group of ladies. Each brought their own strengths, their own climbing history, their own personalities, and each made a significant contribution. We bonded over Nepalese food, joking about how much more fun we'd have than the guys' teams. Suiting up at climbing school! We woke early Thursday morning to a cloud covered sky, and took a shuttle up to the Paradise Visitors Center. Melissa made sure to point out our shuttle carefully, lest we jump in the one full of climbers planning to hike to Camp Muir that day by mistake! With light packs, we easily made our way up to a snow-covered slope. We spend the morning learning how to use the rest step to conserve energy, how to pressure breathe and how to kick steps, making sure each step was better for the person behind us. The word of the day was "efficiency." The afternoon's lessons included self arresting, traveling in rope teams, rope management, proper rope interval, good communication, and lots of giggling. It was the best day of mountaineering instruction I've ever had. Solveig and Melissa did an amazing job of explaining and demonstrating skills in a way we could all understand. After discussions of layering systems, food rationing, and what to expect en route to Camp Muir the next day, we hiked back down to Paradise. I managed a giant bowl of fettuccine alfredo at the Copper Creek Inn for dinner despite the butterflies in my stomach. After seven months of preparation, we were ready to climb.